The OP Swim team has finished the second half of its regular season, competing in 6 dual meets against 6 teams around Union County. The team won 2 of the six meets, defeating Plainfield and Elizabeth and falling to Governor Livingston, New Providence, Scotch Plains, and Westfield. The team now moves to focus on the County Championship at Rutgers, the Prep Championship at Lawrenceville, and the Non-Public B State Final. The first of the 2 victories for the team came against Plainfield in a score of 111-56. The OP Swimmers came out strong, winning every event. The day saw excellent swims from great swimmers, like Junior Luke Bernstein’s first-place finish with a time of 5:52.07. Senior Andrew Meisner also had a successful day in the pool, winning the 200 IM and the 100 Backstroke, and helped to lead the 200 Medley Relay and 400 Freestyle relay teams to first-place finishes. The team saw another victory on January 22 against Elizabeth, with a score of 95-75. This meet was a nailbiter for much of its duration. However, late victories by Junior Kyle Roethlin in the 100 Free, Senior Andrew Meisner in the 500 free, and Sophomore Sam Ilagan in the 100 Breaststroke helped to secure the victory for the Rams. The OP Swim team now looks towards the future, with championship season starting Sunday, January 27th at the Union County Championship meet at Rutgers. The Rams hope for fast swims in this exciting meet. 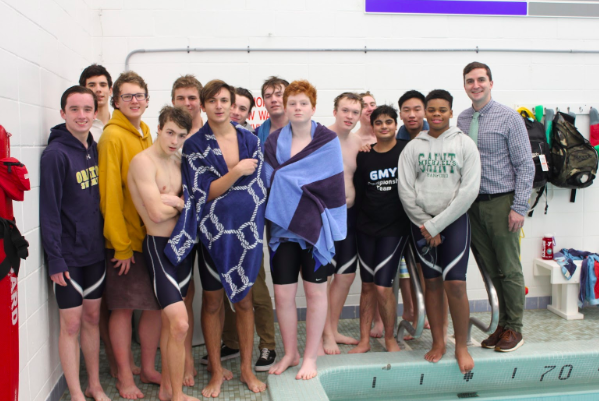 In early February, the Swim Team will compete against other prep schools at the Preps Championship in Lawrenceville. To finish out the season the Rams will swim in the Non-Public B State Tournament. Stay tuned for an analysis of the Non-Public B State Tournament!